In Soul Sacrifice, players are cast as a nameless prisoner, waiting to be devoured by a monster named Magusar. The prisoner’s only hope of survival is to talk to and read a sentient book named Librom. Librom lets the prisoner relive the events of a nameless sorcerer from ages past. 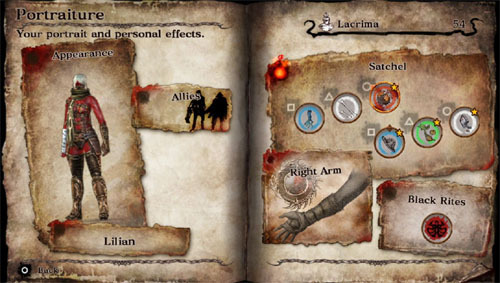 Soul Sacrifice is composed of dozens and dozens of little missions scattered across three main categories. These categories are the single-player story campaign, Fellow Sorcerers (new tales/sorcerers are unlocked by playing the campaign), and Avalon Pacts. Several missions are lumped together under a common theme (e.g. focusing on a particular story point or sorcerer), and bits of story are revealed in between each mission of the campaign and Fellow Sorcerers sections. Character customization will be a huge draw to the game for many. I don’t mean aesthetics (though you can do a reasonable amount of customizing that as well), I mean gameplay customization. For the sake of brevity, I will keep a description of the customization to a minimum. Just know that there is a whole lot more going on than what I relay here. Players can customize their Satchel, Right Arm, Black Rites, and Allies. The Satchel is basically the spell casting system of the game. Six “offerings” (these are spells, weapons, and whatever you use to fight enemies) can be equipped at any given time and can be swapped whenever you want outside of a mission. There’s a ridiculous amount of offerings in the game - so many, I can’t even guess an accurate number - and many offerings can be combined with others to get new offerings. Players can also “boost” offerings by combining two of the same type to get a ranked up offering. The Right Arm is the passive skills system. “Sigils” can be unlocked and equipped in your arm which can boost a whole variety of things (e.g. defense bonuses, offense bonuses, offering effect bonuses). Sigils are gained by saving or sacrificing a specified amount of certain monsters - the details of a sigil will reveal this information. Black Rites, on the other hand, are crazy strong spells players can use after their health gets to a critical point on a mission. There are permanent and punishing debuffs to the player that used them, but players can erase that harsh effect by using “lacrima,” a limited currency that you get from completing missions. Lacrima is used to correct all sorts of boo-boos, and you’ll be glad the game has such a system in place. Allies are companions players can select from a list of companions to accompany them on Avalon Pacts in single-player (they are not available in co-op play). Allies are unlocked through completing certain story points or saving bosses. Sound complicated? It is, a little, but it’s also awesome. Very little of the customization is explained, so make sure you spend a fair amount of time looking at the detail screens and reading any text that the game offers you. What about the actual gameplay, though?